The Singapore Flyer is the world's largest Ferris wheel. Knowing who invented the Ferris wheel and understanding more about the original design for this popular amusement ride can help theme park enthusiasts develop a greater appreciation for their favorite attraction. In just over a century, the Ferris wheel has evolved from a novelty exhibition to an amusement park staple, and it is sure to remain a popular ride for generations to come. 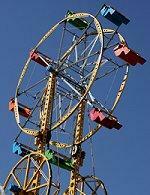 The first Ferris wheel was invented by George Washington Gale Ferris, a bridge builder from Pittsburgh, Pennsylvania. George Ferris was also the founder of the GWG Ferris & Co. steel inspection firm and worked with engineers and manufacturers to inspect the structural steel of bridges and railroads. This background gave him extensive expertise about the strength and capabilities of structural steel, and in 1893 he unveiled the first Ferris wheel at the World's Fair in Chicago as an exhibit to rival the Eiffel Tower replica at an earlier World's Fair, as well as to showcase the unique versatility of carefully engineered steel. The first Ferris wheel was a massive project. The wheel itself had a diameter of 250 feet and a circumference of 825 feet, and it was supported by a pair of 140 foot tall towers. Dual 1,000 horsepower engines propelled the wheel, though two revolutions (one for loading and unloading, and one uninterrupted revolution) took 20 minutes. Visitors to the World's Fair could enjoy a spin on this novelty ride for $.50 - a hefty sum in 1893 - and the wheel brought in more than $725,000 during the fair. After the World's Fair, the massive wheel was relocated several times until it was eventually dismantled in 1906. Though that initial wheel may only have lasted a few years, the impact it would have on the amusement industry is still felt today. 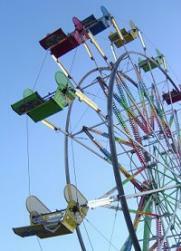 Today, Ferris wheels come in a wide range of sizes and styles. While each wheel is instantly recognizable for its cabins-on-a-rotating-wheel design, there is much variation among individual wheels. Size: Small carnival wheels may only have one or two dozen cabins for few riders, while larger wheels may have 100 or more cabins that can accommodate dozens of passengers each. Large wheels are often called giant wheels or mega wheels to differentiate them from smaller, classic styles. Cabin Shape: Cabins may be designed as balloons, gondolas, simple seats, or luxurious compartments depending on the wheel's location, size, and target market. Colors: The two most common color schemes for Ferris wheels are plain white wheels or rainbow colors. Simple, minimalist colors are preferred for many modern wheels used as individual tourist attractions, while brighter, dazzling colors are popular on amusement park and carnival rides. Multiple Wheels: Both double and triple Ferris wheels have been designed, involving multiple wheels that move about a central hub and themselves rotate individually. Another, less common variation is for the cabins themselves to move along sliding spokes to add a unique dimension to the ride. Lighting: Because Ferris wheels are instantly recognizable, they often become icons for the cities or parks where they are built. Elaborate lighting designs may include logos or patterns that offer a stunning show when the wheel is operating at night. 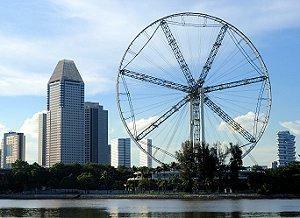 Singapore Flyer: Located in Singapore, this is the largest Ferris wheel in the world and stands 541 feet high. It first opened to the public in March 2008. Star of Nanchang: This wheel in China is 520 feet tall and first opened in May 2006. London Eye: This 440 foot tall Ferris wheel in the United Kingdom opened in March 2000. Ferris wheels may be popular attractions around the world, but they are not necessarily suitable for every rider. Because of the nature and design of the ride, individuals who are afraid of heights or who experience extreme vertigo may want to avoid Ferris wheels. Completely enclosed cabins, such as those found on urban wheels, may present problems for individuals with claustrophobia. Riders who are very sensitive to motion sickness may also want to avoid the swaying Ferris wheel cars, particularly on smaller rides. George W. Ferris was the engineer who invented the Ferris wheel, but his invention didn't stop with one unique World's Fair attraction. Today, there are thousands of Ferris wheels at amusement parks and in cities around the world, and they continue to be a popular attraction for millions of riders.